A.T.M. Gunananda Trinco. Special corr. 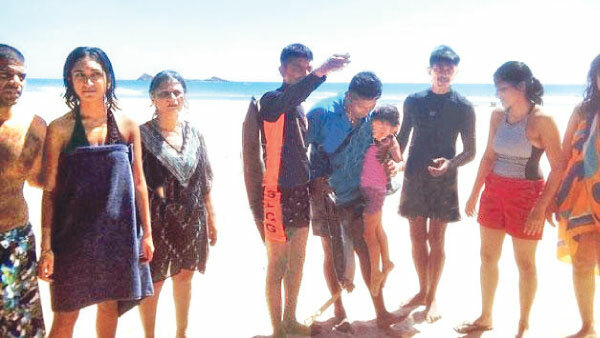 Police life savers managed to rescue six tourists who were on the verge of drowning in the seas off Nilaweli in Trincomalee yesterday (23). Five Indian women including a 5-year-old child and an American were rescued by the lifeguards. The lifeguards got down to action on hearing the screams of the six tourists, who were drifting away and managed to rescue them. The rescued tourists were brought back to the shore in a boat with the help of a Naval Coast Guard. The tourists had been visiting Trincomalee to attend the wedding of a foreign couple at a hotel in Nilaweli. Police Lifeguard Unit OIC, SI Manoj Ariyaratne directed the operation to rescue the tourists who were in difficulty with the help of PCs Marasinghe, Samarasinghe and Madhusanka.